BEIJING, June 26 -- Top legislator Zhang Dejiang said Monday that the unwavering implementation of the "one country, two systems" principle and the Basic Law have effectively maintained prosperity and stability in Hong Kong over the past 20 years. The implementation has also helped safeguard China's sovereignty, security and development interests, Zhang said in Beijing. Zhang, chairman of the Standing Committee of the National People's Congress, and a member of the Standing Committee of the Political Bureau of the Communist Party of China (CPC) Central Committee, made the remarks while meeting with Hong Kong Chief Executive CY Leung, and Lam Cheng Yuet-ngor, who will take office as the new chief executive on July 1. 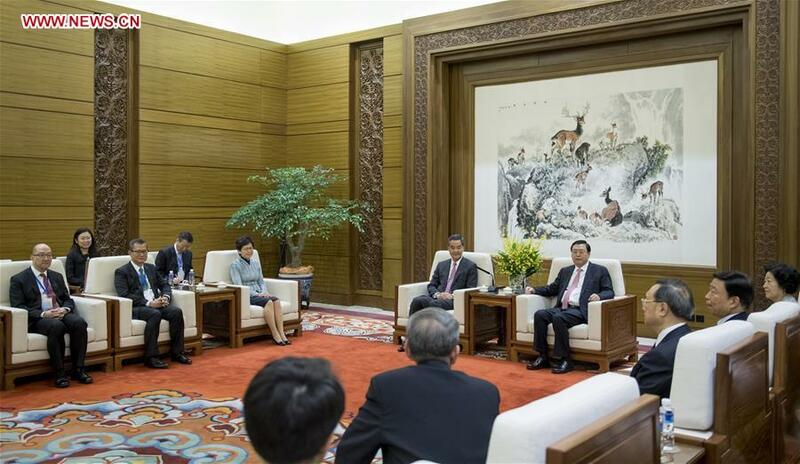 Zhang called on the Hong Kong Special Administrative Region (SAR) government and the society to continue to contribute to Hong Kong's bright future and the realization of the Chinese dream of national rejuvenation. The central authority fully recognized the work of the Hong Kong SAR government led by Leung over the past five years, Zhang said, voicing hope that it will continue to make progress under the new leadership. After the meeting, Zhang attended the opening ceremony of an exhibition at the National Museum in Beijing profiling the achievements in Hong Kong since its return to the motherland in 1997. State Councilor Yang Jiechi called the achievements by Hong Kong in the past 20 years "remarkable," and attributed them to the "one country, two systems" policy and the concerted efforts of Hong Kong compatriots. Hong Kong's prosperity and stability have proved that the "one country, two systems" is the best arrangement for Hong Kong, said Leung while addressing the ceremony. Hong Kong will continue to give full play to the unique advantage of the policy and strive to realize national rejuvenation and build a better Hong Kong, Leung said. More than 450 people attended the ceremony, including Sun Chunlan, head of the United Front Work Department of the CPC Central Committee, and Vice President Li Yuanchao.